I've been researching smuggling for my soon-to-be-started WIP (a revenue officer, a governess, and a ghost in Orkney!). Mostly what I'm discovering is how incredibly widespread and shameless smuggling was. It operated in many ways like our modern-day Mafia--but before the 80s mob trials. Revenue officers knew who the smugglers were. Often they even had advance knowledge of smuggling runs. But they were so badly outnumbered that in many cases, the officer or two (even if he was backed by half-a-dozen dragoons) had to simply watch as sixty or a hundred armed men rode by escorting huge cargoes. There were cases of small fleets of smuggling ships coming into an inlet where a Revenue cutter lay at anchor and saying, "Cut your anchor and take off or we'll sink you!" (But with worse language, my book made sure to clarify!) And the ship had really no choice but to do it. Even if smugglers could be arrested, it was rare to find a jury that would convict them. This was both because of genuine local support for the smugglers (who kept local economies going and stood up to the Man) and because of fear. Smugglers set fire to the stables and ricks of farmers who refused to allow their horses to be used, and tortured and/or murdered informers. One of the most famous smuggling organizations was the Hawkhurst Gang (like Adrian!) in Kent. This gang operated quite openly and violently. In one instance, they beat, interrogated, and flogged some revenue officers who tried to challenge them, then carried them across the Channel and dumped them on enemy French soil in their King's uniforms. The Mermaid Inn was a popular hangout for the gang, who would carouse there with their weapons out on the table. In 1747 the town of Goudhurst decided they were tired of the Hawkhurst Gang's reign of terror. They formed the Goudhurst Militia, to be trained and let by a former sergeant in a foot regiment of the line. 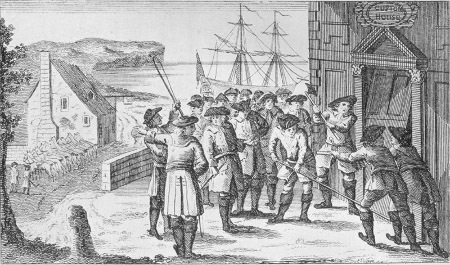 When the gang heard, they were furious and attacked the town's new defenses, pushing the militia into the town. They managed to capture one of the militiamen and tortured him for information. Once they had gotten out of him all the militia's preparations, they sent him home ("mangled," my book says) to tell the town that the gang would attack on April 20th, kill every person found in the town including women and children, and then burn it down. The town didn't back down. The women and children were sent away for safety and Goudhurst was speedily fortified, with the church as the final line of defense. "Kingsmill [the leader of the Hawkhurst Gang] formally called on Stuart [the sergeant] to surrender, in correct military procedure." (Geoffrey Morley's The Smuggling War.) An intense battle ensued, in which Kingsmill's brother was shot down and died beside him. Startlingly (to me) the villagers got the upper hand, wounding most of the smugglers and eventually pursuing the retreating smugglers back to Hawkhurst. And the government did nothing while all this was going on! Of course, there was no organized police force at the time and bringing the army out against their own citizens...I'm sure no one wanted another Civil War. But it's mind-boggling, isn't it? Here's what the government did do: they cut the import duty on tea. Smuggling was profitable because import duties on their products were so high: smugglers could sell their tea, brandy, lace and so on for much more than they had paid for it and still be far below the price set by legal merchants. It was estimated at one point that smugglers would still make a profit even if only one in three of their cargoes made it into England. So the smugglers were actually angry at the government for lowering the tea tax, which tells you exactly how seriously to take their "We only smuggle because the taxes are unfairly high" argument. So a few months later (September 1747), a Revenue cutter captured a Hawkhurst ship and took her to the nearest port: Poole in Dorset. Her enormous cargo of tea and some alcohol and other things was unloaded into the Customs House. When someone finally informed on the gang, the Hawkhurst Gang abducted him and the officer (Charles Galley, an elderly man) escorting him, torturing and whipping them as they carried them back to Hawkhurst. The officer finally fell off his horse, and the smugglers buried him alive in a fox earth (some sites say "possibly" still alive). Galley Grove, site of the officer's grave and now named after him. Seven of the men responsible were finally caught and tried for their part in the raid on the Customs House, but only because one of their own turned Crown's evidence! They were tried in London rather than in their home turf. Kingsmill and three of his men were given the death penalty, and right up until their execution they insisted they were innocent since the contraband they had stolen back was their property which they had bought and paid for. Like pirates, smugglers are a group of people that are fun to romanticize, but the truth is pretty ugly. On the other hand, they never would have become so powerful or violent without unreasonable taxes on common items (just enact an income tax already, for realz! ), without the death penalty which made smugglers desperate not to be caught, or without widespread desperate poverty to create the large workforce. Do you have a favorite romance about smuggling? Do you think smugglers make good heroes? I suspect that the argument about the tax being too high appealed more to the people buying the smugglers' goods than to the smugglers themselves. The sheer viciousness of their behavior suggests that they were attracted to smuggling by the opportunity to indulge in lawlessness. It was their customers who consoled themselves with the claim that they were only buying the goods because the tax was too high. It's rather like drugs these days. People buy their cocaine/marijuana/whatever, arguing that the drugs should be legalized and ignoring the horrendous drug wars in Mexico and Columbia (to say nothing of the violence of drug dealers in the United States)—all of which are fueled by the money they pay. So no, I'm not real keen on smuggler heroes. Sorry. I agree with you on everything but the idea that smugglers are attracted to their profession by lawlessness. I think they're just attracted by the money! But because what they're doing is illegal, they have to be violent to protect their cash flow. So by setting up the laws that way, the government creates a violent criminal class when they could have just had cutthroat businessmen instead. (Also frequently unpleasant and unethical, but a lot less bloody. Until their workers start trying to unionize anyway...) I agree, the modern drug war is a great comparison, as is Prohibition in the US. So yeah, I'm not as into smuggler heroes as I could be...although it's hypocritical because I adore a good pirate. Wonderful post, Rose! I had smugglers in my book BENEATH A SILENT MOON - a quite ruthless mastermind from London and some locals who are in it because they're desperately poor. I think your analysis about the laws setting up a violent criminal class is spot on. I agree it would be hard to write a smuggler hero - I think it could be done. It would be a question of the background that got him into it as you say and how ruthless he was. A lady called Frances Wilkins has wriiten several books about smuggling in Scotland - they're based on Excise and other records, so well worth a look. Tracy--I think it could be done too! Which makes me wonder...are there any Mafia romances? Alison--ooh, thanks for the rec! I'll look into her.